PEC $1.21, after selling down for almost 2weeks today it gap down during open and close the day with at Doji candlestick (reversal pattern). With higher volume than yesterday, it seems to be supported by investor at this level. CCI oversold at <-100, and price between 20ma and 40ma. Can consider enter at 1.23, stoploss 1.18, target 1.38 timeframe: 1-2weeks. Can sell half when profit target is hit and hold the other half for long term. Hi-P 1.11, also had a swing setup. 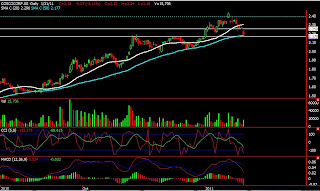 This stock has recently attempted to breakout, but i think it postpone its rally due to the bad market sentiment. During the past week, when market corrects heavily, this stock still holding strong around this level. Can consider entry at 1.14 tomorrow, stoploss 1.10, target 1.19. timeframe: 1-2weeks. Can sell half when profit target is hit and hold the other half for long term. Coscocorp 2.18, this stock is clearly on an uptrend, a good time to pick up these uptrend stocks is during market correction. 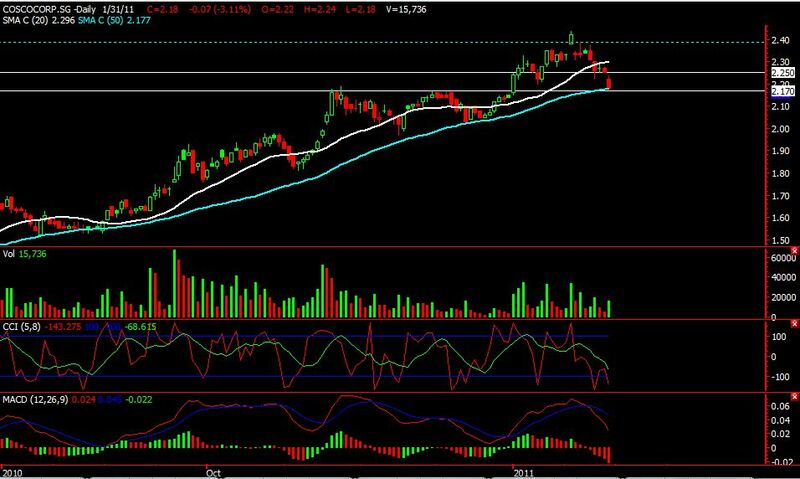 As it is now support by the 50ma, can consider swing trade. Entry 2.25, Stoploss 2.17 target 2.44, timeframe: 1-2weeks. Can sell half when profit target is hit and hold the other half for long term.